Veteran hard rock singer Frank DiMino has released the second video from his current Old Habits Die Hard album. "Never Again" reunites the singer with ANGEL guitarist Punky Meadows who makes a cameo appearance. The video was shot over two days in and around Frank's adopted hometown of Las Vegas, including the famed Bootlegger Bistro. Additional filming was done in North Carolina. Watch the video for "Never Again" on KNAC.COM right HERE. The video stars 2015 Miss Nevada United States Amanda Gibson and actor Mark Justice, whose film credits include Bleach (Eric Roberts) and The Immortal Wars (Tom Sizemore). It was directed by Paul Gervasi from the feature film Cherri Future and whose music video credits include Melissa Manchester, Katja Rieckermann (Rod Stewart), and production for Lady Gaga’s “G.U.Y.”. The video is basically a tribute to Mad Max racing through the desert with a Dark Angel watching over a young, turbulent couple. 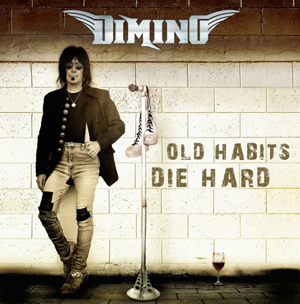 DiMino's Old Habits Die Hard was released in July of 2015 through the Frontiers Music srl label and features collaborations with former ANGEL bandmates Punky Meadows and Barry Brandt, as well as Paul Crook (MEAT LOAF, ANTHRAX), Oz Fox (STRYPER), Eddie Ojeda (TWISTED SISTER) and Rickey Medlocke (LYNYRD SKYNYRD, BLACKFOOT) amongst others.